Is Russia’s U.N. vote on Libya part of a wider, post-Imperial foreign policy in the Kremlin? That is the question Moscow is debating as Russians watch from the sidelines as needle-nosed Western jets bomb military targets in Libya, once a Soviet ally. Diplomats schooled in Soviet ways would have expected Russia last week to veto the United Nations Security Council resolution authorizing the use of force against the military of Libyan leader Moammar Gadhafi. Instead, Russia abstained. Clearly, Russia’s leadership did not want to throw the new relationship with Washington under the bus for Libya. A bit like British politicians harrumphing their way through the 1960s, imperial nostalgia has lasting appeal in Moscow. Prime Minister Putin, once a KGB agent stationed in East Germany, stepped up to play the old Soviet role of “Mr. Nyet.” Answering the unspoken desire of many Russians – “Let Putin be Putin” – the Russian leader lambasted U.S., British and French attacks in Libya as a “medieval crusade.” At the same time, Putin youth, the Nashi and Stal groups, picketed the U.S., U.K. and French embassies in Moscow. Then, in the worst possible timing, the U.S. secretary of defense, Robert Gates, came to town for a long planned visit. Kremlin choreographers had a chore figuring out how to handle this inconvenient guest. Russia’s defense minister, Anatoly Serdyukov, was chosen to be the fall guy to give the televised lecture to Gates calling for a ceasefire, a call that everyone knew would be ignored. 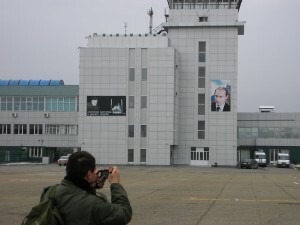 Tuesday night, state-controlled television led the news with lengthy reports on Mr. Putin’s trip to Slovenia. About 15 minutes into the programs, viewers learned that, oh, yes, the most powerful military man in the world was in Moscow today. Not allowed to open his mouth on Russian TV, Mr. Gates was largely seen patiently sitting through lectures by President Medvedev and the Defense Minister. Fyodor Lukyanov, editor of Russian in the journal Global Affairs, gave me a different take on Mr. Putin’s “crusade” comment. Noting that it was made while he was visiting an intercontinental ballistic missile factory, he said that a hidden motive may have been to bolster internal support for Russia’s new military spending program. Over the next decade, Russia is to spend $750 billion to rearm its military. For Russia, the geostrategic insecurity that dare not speak its name is spelled C-h-i-n-a. So instead of Beijing, Moscow may be using phantom foreign threats to justify its investments in arms. Last month, Russia rattled its sabers against the Japanese, making enough noise to slip new air defense systems into Russia’s Northern Pacific islands, presumably without the Chinese taking offense. This month, the performance of NATO member militaries against targets in Libya is a timely justification for more spending on high performance fighter jets. 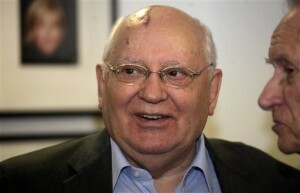 Interestingly, there has been little concern coming out of the Kremlin about the fate of Colonel Gadhafi. 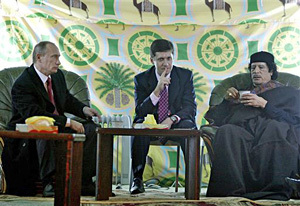 Two years ago, in November 2008, the Libyan leader pitched his desert tent inside the Kremlin walls for a state visit, giving Prime Minister Putin and President Medvedev a chance size him up. Let’s just say that they have not spoken out on his behalf in recent days. For the first time in almost two decades, Moscow authorities will not allow a Saint Patrick’s Day Parade. Every year, since 1992, the Irish community has led a street parade through the center of Moscow. Increasingly popular with Muscovites, the parade draws thousands of Russian revelers, many with their hair dyed green. But this year, Russian officials worry that behind the emerald green lurks revolutionary red. In this season of revolution, a St. Patrick’s Day parade could be hijacked by democracy protesters. So city officials, who routinely clog streets with their motorcades, declared that in the interests of avoiding clogged streets, the annual St. Patrick’s Day parade would not be held. The Irish Business Club gamely offered a substitute – an indoor song fest. Russia’s rulers are not the only ones to worry about St. Patrick-the-Subversive. Two days after Moscow, Shanghai officials also banned their annual St. Patrick’s Day parade. In Moscow, a common dinner party game is to look at the area of the former Soviet Union and debate which of the 15 countries are most vulnerable to an Arab-style democracy revolt. Although Russia’s ruling party had a lackluster showing in elections on Sunday, the general belief is that Russia is safe for authoritarianism, for now. In a poll conducted nationwide last month, 49 percent of respondents said they were dissatisfied and ready to participate in a protest, a jump from 32 percent in December. But Russia’s oil is selling at $115 a barrel – 50 percent over last year’s price. This price spike has been perfectly timed for Prime Minister Putin. Facing parliamentary and presidential elections over the next year, he has plenty of rubles to jolly voters with higher pensions and state salaries. In Russia, the Kremlin worries less about a youth revolt and than about a pensioners’ revolt. In a reverse of Egyptian demographics, one million young Russians enter the job market each year, while 2.5 million workers exit, either through death or retirement. The vulnerable parts of the former Soviet Union are the ‘stans’ – the six republics with young, Muslim-majority populations that take some inspiration from Cairo. Last month, Kazakhstan, the richest and most economically successful, scheduled a surprise presidential election for April 3. The idea is to lock in the genuine popularity of the nation’s long running president, Nursultan Nazarbayev. Kyrgyzstan has had two revolutions in five years. Tajikstan is still recovering from a civil war in the mid-1990s that claimed 100,000 lives. Turkmenistan probably has enough oil and gas billions to pacify its relatively small population of five million. The two most vulnerable are Azerbaijan and Uzbekistan, two countries with entrenched ruling families, high corruption, high unemployment and large, young populations. Transparency International’s corruption index places them at the bottom of the barrel – Azerbaijan at 134 and Uzbekistan at 172. Uzbekistan has been ruled since 1989 by Islam Karimov. Now he is 73 and without a male heir, a key obstacle to creating a political dynasty in Central Asia. State controls, monopolies and corruption have retarded economic development and fostered huge income gaps, pushing many of Uzbekistan’s 27 million people to look for jobs elsewhere. Azerbaijan has been run by the Aliyevs for the last 42 years — first by Heydar Aliyev, who started the dynasty in 1969 as First Secretary of the Communist Party of Azerbaijan. On Friday and Saturday, the protests started, spread by Facebook and Twitter. Azeri police moved in fast, arresting 150 young people around Baku’s Fountain Square, including anyone wearing a red T-shirt. There will be no St. Patrick’s Day Parade in Baku. 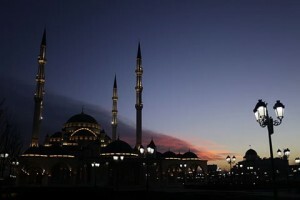 Grozny’s new mosque, The Heart of Chechnya, is modeled after the Blue Mosque of Istanbul and has minarets soaring 60 meters into the sky. Behind construction workers are building three office and apartment towers, the tallest towers in the Caucasus. On a field outside of this city of 350,000, finishing touches are being put on a new, 30,000-seat glass and cement football stadium. Chechen officials hope that Moscow will include Grozny in the list of host cities for 2018 World Cup. 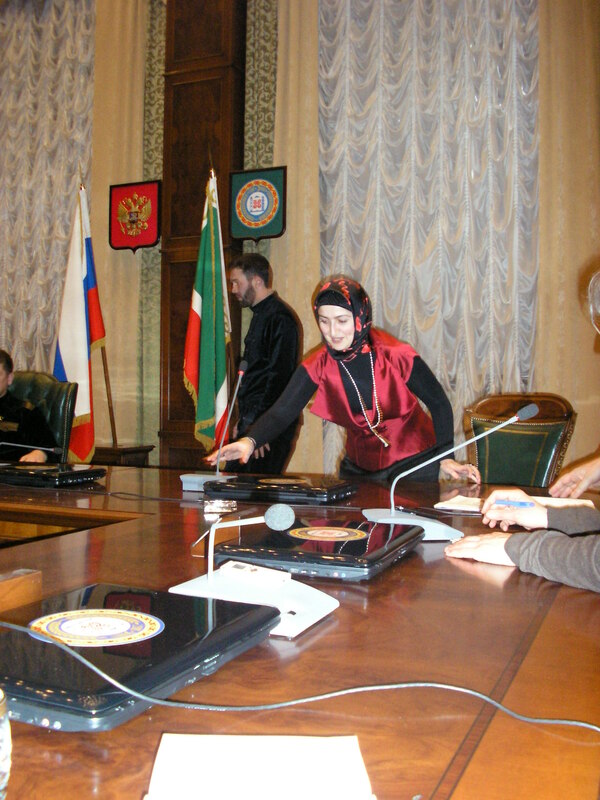 In Moscow, dial-a-quote experts who rely on their knowledge of their Caucasus from trips made 5 to 15 years ago, like to tell reporters that Chechnya is ‘a failed state’ and that the tide of history will sweep the Islamic majority republics out of the Russia Federation. On the ground, the picture is different. Yes, there is violence. Yes, there are lots of poorly shaven young men in strange uniforms carrying fully loaded kalashnikovs. And, yes, Chechnya is probably economically unviable, depending on Moscow for as much as 90 percent of its budget. But, no, the fashionable new dream of Russian nationalists, the dream of cutting off the Caucasus and watching them eat their independence, is not going to happen on the watch of the Putin-Medvedev tandemocracy. After visits in recent weeks to Chechnya and neighboring Ingushetia, it is clear to me that the Kremlin will shovel south as many rubles as it takes to keep the Caucasus under Russia’s wing. Last week, Prime Minister Putin announced that 400 billion rubles will be spent this year on 37 development projects in the Caucasus. With Russia’s oil-inflated ruble trading at 28.7 to the dollar, that means $14 billion for 5 million people who are spread over less than 1 percent of Russia’s territory. On my visit to Grozny, I searched in vain for evidence of what the city in notorious for – the war devastation that left Chechnya’s capital looking like Stalingrad after the Nazi siege. I came too late. After 1,000 days of frenzied construction activity, the city has been rebuilt. Copy the countryside. A Chechen acquaintance, who investigates cases of people who disappeared during the Chechen wars and current ‘dirty war,’ says the most visible evidence of past fighting are the continued presence of armored personnel carriers in rural areas. While plaster and mortar can cover up the external damage, the internal, psychic damage will take decades to heal. Wednesday afternoon , I was driving in a sagging Lada to the airport (newly refurbished), when the taxi driver mentioned that his brother, then 19, was killed in the early 1990s, fighting for Chechen independence. For a few blocks, a sad, gray cloud hovered over the taxi. 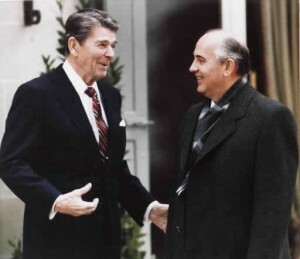 Then he said that Chechnya can only be run by a strong hand. Indeed, somewhat similar to the conflicts I once covered in Central America, Chechens are suffering from war fatigue. They don’t love the Russians any more than they did 15 years ago. They have realized they cannot survive economically on their own. Tuesday night, in the opening ceremony for the Brazil-Grozny football game, massive loudspeakers blared, consecutively, the hymns of Brazil, Russia and Chechnya. As the Italian Romantic notes of the Brazil’s Hino Nacional floated through the mountain air, the 10,000 fans stopped their cheering and yelling to listen to this musical curiosity. When the Russian anthem was played, they chatted, checked cellphones for messages, shuffled their feet, looked down, looked embarassed. 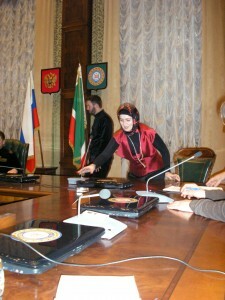 When, the Chechen anthem played, they rediscovered their vocal chords with a collective roar. Mikhail Gorbachev turned 80 on Wednesday. In advance, Russia’s political bear gave himself a birthday present: he came out of political hibernation. 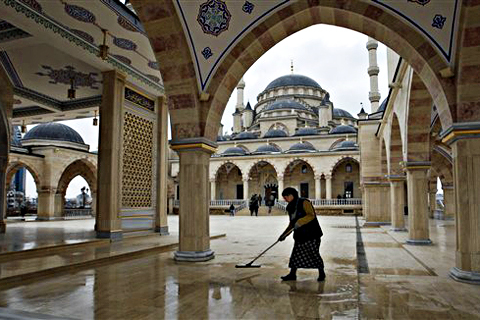 Will Islamic Fundamentalists Threaten Russia’s Winter Olympics? One thousand days from now, television cameras from around the world will focus on Krasnaya Polana, Russia’s new ski resort complex on the western end of the Caucasus Mountains. The ski and snowboard events of the 2014 Winter Olympics will be held on slopes now under construction. Last weekend, Prime Minister Vladimir Putin and President Dmitry Medvedev, met at Krasnaya Polana to watch the European Alpine Ski Competitions. But, simultaneously, several mountain peaks to the east, Russian security officials conducted anti-terrorist operations after the first known Islamist insurgent attack on Russia’s ski industry. On Friday afternoon, masked men in a black car without license plates stopped a van shuttling Moscow skiers from a regional airport to Elbrus, the tallest mountain in the Caucasus chain. When one tourist asked their identities, the men opened fire, killing three and wounding two. 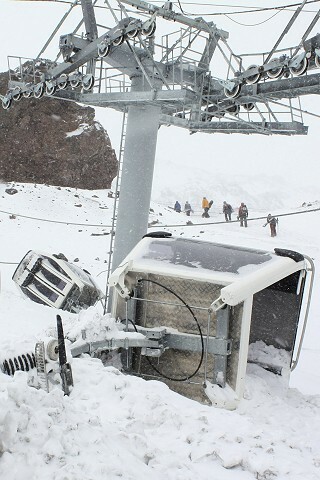 Later in the evening, after all skiers and snowboarders were off Elbrus, an explosion knocked down a pylon of a new Swiss-built gondola. Cables derailed, sending dozens of cabins crashing to the ground. Then, on Saturday, alert security officials detected and defused three bombs in a car parked outside a ski hotel near the base of Elbrus. The bombs contained a total 70 kilos of TNT. 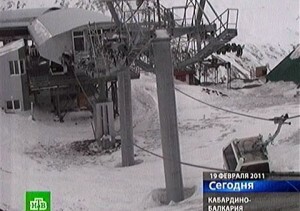 Two winters ago, two friends and I drove up that access road, past that ski hotel, and skied Elbrus. The ethnic Russian driver who met us at the Mineralni Vodi airport became visibly uneasy when the road crossed into the majority Muslim area of Karbardino Balkaria. Going back, the Balkar driver was equally uneasy crossing into the ethnic Russian area around Mineralni Vodi, a Russian spa resort since the 1880s. On the approaches to Elbrus, green flags of Islam flew over family compounds, and new Mosques gleamed in the winter sun. For local men, the main job options seemed to be herding sheep, taking care of skiers, or migrating to Moscow. Along the route, a massive Soviet era Tungsten mining settlement stood largely abandoned, looking like an end of the world film set. Last October, an insurgent group killed several policemen, and then escaped into the mine, never to be seen again. Then on Monday, the site said: “Local apostates and “interior ministry” gangs from other regions are now busy protecting Russian tourists, occupation sources report. Also reported is that many “Russian tourists” hastily left resorts on Saturday and early Sunday. Last month, President Medvedev traveled to the Swiss ski town of Davos and sought $15 billion in foreign investment for a chain of five ski areas across the Caucasus. Last weekend’s attacks at Elbrus are the insurgents’ response. The Caucasus mountains are steep and relatively untouched. One day, they will make for wonderful skiing with breathtaking views. 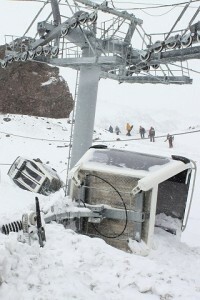 But modern ski areas, with their chair lifts and gondolas, are essentially indefensible. Skiers will not regress 50 years to the era of rope tows and T-bars. Skiers also will not clamber into chair lifts and ride 10 meters over rocks and cliffs if they worry that a terrorist down below may be fastening a bomb to a lift tower. The mountains and their ski slopes can wait. First, the demands and needs of the people living around the Caucasus will have to be taken care of. With the 1,000 day Olympic clock ticking, it is unclear how Russia will meet its security deadline. Can the Arab revolt spread to Russia and the former Soviet Union? I had dinner the other night with Alexei Navalny, Russia’s sandy-haired, impassioned, anti- corruption activist. At 34 years of age, Alexei is using his internet campaign to build a place for himself in Russia’s political future But over dinner, at Moscow’s trendy Red October arts complex, every third sentence of Alexei’s discourse was punctuated by the word ‘Tunees’ – or Tunisia. The Arab revolt, stretching from Tunisia to Bahrain, has transfixed Russia’s beleaguered opposition. Could it happen in Moscow? In Iran and the Arab nations in revolt, the demographic wheel releases millions of young men and women onto weak job markets every year. In contrast, Russia’s population has a profile similar to Japan’s. It is aging and shrinking. Russia’s revolutionaries want their pensions paid on time. Also, the most threatened nations in the Arab world are run by men that people here would consider dinosaurs. Hosni Mubarak was 82 when he was forced to step down in Egypt. Russia’s leadership is relatively youthful. 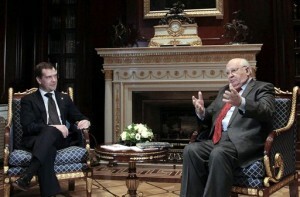 Prime Minister Putin is a vigorous 58. 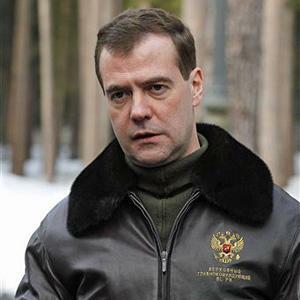 President Medvedev, sometimes called Winnie the Pooh in Russia’s blogosphere, is a soft featured 45. And, so far, Russia’s authoritarian tandem is delivering the goods. Over the last decade, per capita income increased 6-fold in Russia. 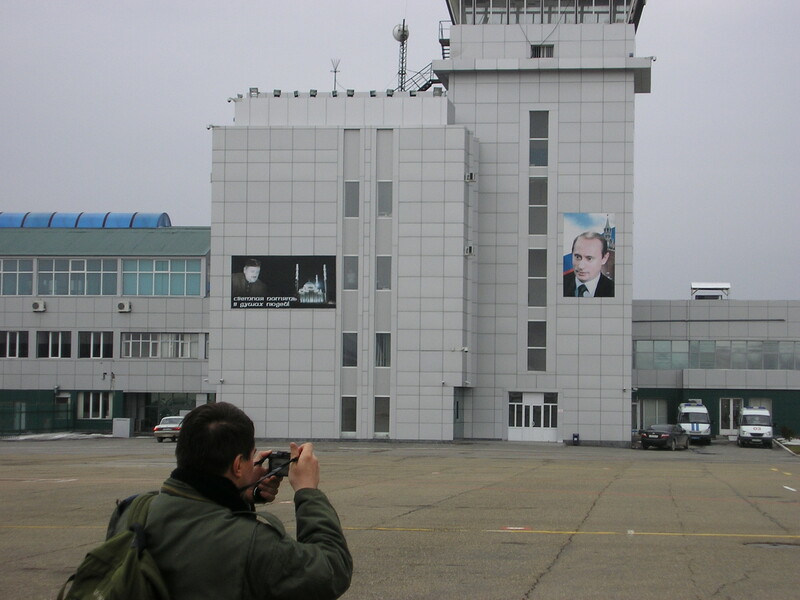 While political freedoms in Putin’s Russia are comparable to Mubarak’s Egypt, Russia has delivered a series of benefits unheard of during the Soviet era – vacationing on a sunny foreign beach, shopping at home in a Western standard mall, driving a world class automobile, attending church or mosque, and surfing the internet. The one part of Russia that is not enjoying this mix of economic consumerism and demographic conservatism is already in revolt. 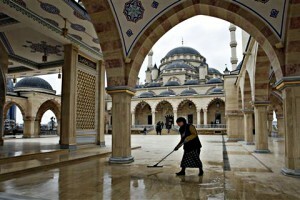 In the southern Caucasus, a largely Muslim area, unemployment ranges around 50 percent. This week, Alexander Khloponin, the presidential envoy to the Caucasus, estimated that the average age of the 1,000 active insurgents in the Caucasus is 18. Other parts of the former Soviet Union where generational turmoil threatens entrenched rulers are Belarus and two countries in Central Asia, Tajikstan and Uzbekistan. Alexander Lukashenko, a former collective farm manager, rules Belarus, a nation that is now 75 percent urbanized. Short term, he is holding on in face of widespread domestic opposition, a wall of hostility from the European Union, and skepticism from the Kremlin. In Central Asia, rising tides of young job seekers are colliding with collapsing infrastructure implanted by the Soviet Union in the 1970s and 1980s. In a report last week, the International Crisis Group said that in Uzbekistan, Kyrgyzstan and Tajikistan, young people are fed and educated more poorly than during the Soviet times. For now, emigration to Russia to work is the only solution. Popular revolts have happened in Kyrgyzstan. More are expected in Tajikistan and Uzbekistan. But at the end of the day, Russia’s own political fate is determined by the price of oil. Taxes on oil and gas sales account for 40 percent of Russia’s budget. With oil near $100 a barrel, as it is today, the Kremlin can continue to run Russia like Alaska, handing out relatively generous social benefits subsidized by natural resource exports. With parliamentary and presidential elections to take place in Russia over the next year, the Kremlin last year boosted pensions by 45 percent. 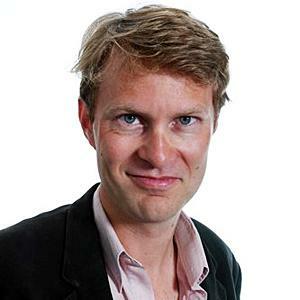 Kremlin Fear of WikiLeaks lead to deportation of British reporter? 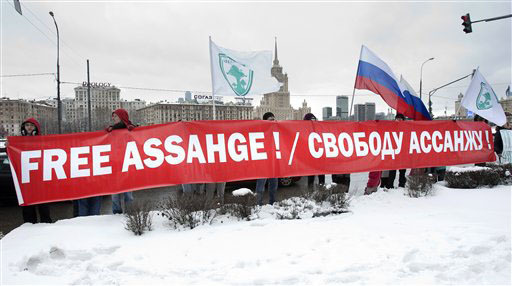 Marching on an embankment between the ice-bound Moscow River and the snow-bound British Embassy, a pro-Kremlin youth group demonstrated last month for the freedom of Julian Assange, the mastermind behind WikiLeaks. At the time, I wondered: how long will it take for these dunderheads to learn the party line? Luke and I had bumped into each other now and then since he moved here in 2007. Often the two tallest members of the Anglo-American press community here, we seemed to naturally collide at events. On one train ride out of Moscow, in the summer of 2008, Luke described to me what he saw as a pattern of intelligence service monitoring. On returning to their apartment after an excursion, the Harding family would find that a toy or another household item had been moved in their absence. Luke said it was the intelligence services way of signaling to him that they were watching. Other run-ins followed, including a detention in Ingushetia, a republic in the war-torn Caucasus. Last November, officials formally canceled his visa. He appealed and won a six-month reprieve so his son and daughter could finish their school year in Moscow. Five days before flying to Moscow, Luke and his co-author, David Leigh, launched in London their new book: WikiLeaks: Inside Julian Assange’s War on Secrecy. Luke’s expulsion may be the FSB’s way of sending a warning shot to foreign and Russian reporters alike: WikiLeaks and Russia’s election year will not make a healthy mix. 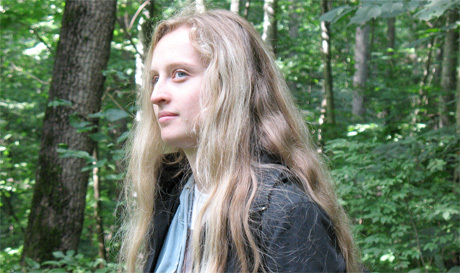 While Luke wrote his WikiLeaks book, his wife, Phoebe Taplin, wrote Phoebe’s Weekend Walks. This column runs weekly in The Moscow News, a government-owned biweekly newspaper here. An indomitable British woman, of the mold who favor hiking books in a land of stiletto heels, Phoebe created what is probably the best read feature of The Moscow News. Coaxing – or dragging – her mop-haired son and daughter over hill and dale, she produced a weekly column for Russia ramblers. I once cornered her at a news event party and told her that directions were so vague in one column that a friend and I ended up fording frigid streams and climbing over barbed wire fences. She diligently took note. I later heard that she would sometimes do a walk twice to get the directions right. Her fans grew over the years. For expat wives, it became a social coup to be invited to join her rambles. I was told she had her very own undercover FSB female agent assigned to her walking parties, presumably to shoo off barking dogs and defuse grumpy locals. With an eye to the future, Phoebe had the savvy to only surrender one time publication rights to the newspaper. It was Friday night at the Assa. That’s the top hotel in Ingushetia, a republic in Russia’s heavily Islamic Caucasus region. 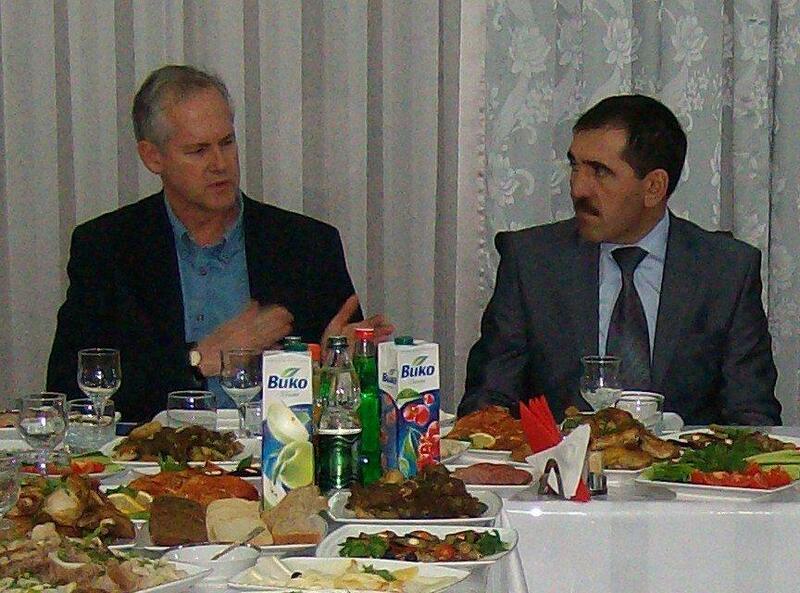 There were two tables of visiting journalists. And in one corner, at a third table: six ethnic Russian men, eating dinner and quietly nursing their vodkas. Something did not add up. Russian men, Friday night, vodka — and quiet? Suddenly, three Ingush men in full camouflage and carrying automatic weapons swaggered through the restaurant door. One man’s face was fully masked with a black wool balaclava. Russians call this hat a “racketyorka,” because they are favored by racketeers. Our armed guards sprung into action. Tense negotiations in Ingush ensued. The restaurant is being closed, we were told, for serving alcohol. There are bad men who cruise the city at night, we were told. The hotel could be shot up for serving alcohol. It is haram, forbidden. I made sympathetic noises, and deftly moved my table’s bottle of Moldovan red wine to the floor. The Russians, who as locals knew the rules better than we out-of-towners, sheepishly got up, paid their bill, put on their fur hats and overcoats, and disappeared into the winter night. Once they were gone, the waitress hurried over to explain that the restaurant was not really closing. Local rules dictate that the hotel can only serve alcohol to registered guests, not to locals who came in off the street. In this corner of Russia, and in neighboring Chechnya and Dagestan, Russian law is stepping aside in face of an Islamic revival. In Ingushetia, a bombing campaign has restricted alcohol sales to a handful of stores that operate behind bomb barriers. 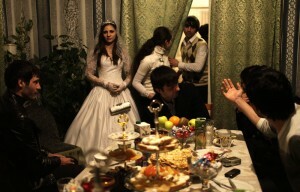 Diana Markosian, the VOA Moscow producer, attended a wedding Saturday night in Ingushetia where the dancing went on until 3 am. But the refreshments would have been appropriate for a Cub Scout meeting in suburban America. 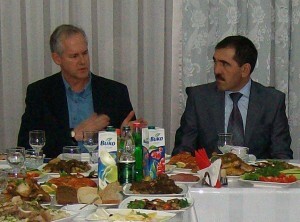 Thursday night, Yunus-Bek Yevkurov, the republic’s president, offered a dinner for visiting foreign correspondents. The banquet table was dominated by large boxes of fruit juice. Although a few underground speakeasies exist in Ingushetia, locals who want to drink safely drive half an hour to the west, to Vladikavkaz, capital of Northern Ossetia, a predominantly Christian republic. In face of this rapid Islamisation of the three ‘Green Republics’ of the Caucasus – Ingushetia, Chechnya and Dagestan – the ethnic Russian population has dropped to less than one percent. The Russians have retreated to two historically Christian strongholds in the southern Caucasus – Stavropol and Northern Ossetia. Many have settled in Vladikavkaz, which means Ruler of the Caucasus. Founded in 1784, this fortress city garrisoned czarist troops who ultimately imposed Russian rule over the Islamic populations of the Caucasus. Now, as evidenced by the alcohol divide, the cultural and religious fault lines in the Caucasus are reverting to where they were in the days of Catherine the Great. 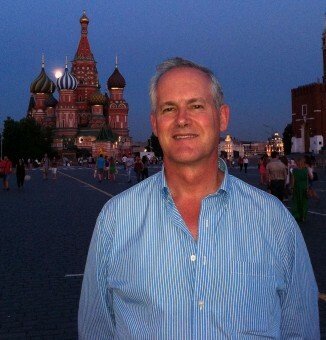 I traveled through a Moscow airport this weekend. Security checks were tight, but the passenger flow was normal. Indeed, on the evening of last week’s suicide bombing at Moscow’s Domodedevo Airport, passenger jets continued landing and taking off. At the main entrance, ambulances continued ferrying away the 35 dead and 168 wounded. The bomb blasted area, the waiting zone for international arrivals, was blocked from view by blue plastic sheets. Nearby, clerks at taxi counters and mobile phone rental stands went back to their work shifts. Over the last year, terrorists caused the deadly derailing of a luxury train to St. Petersburg and exploded bombs in Moscow subway cars packed with morning rush hour commuters. Facing seemingly endless attacks by Islamic radicals from the Russia’s southern fringe, some Muscovites trudge along, acting as if they were living through a slow motion version of the London Blitz of 1940-41. Last weekend, false bomb reports forced the evacuation of tens of thousands of shoppers from malls in suburban Moscow, creating massive traffic jams that stretched for miles through the winter dark. This week, the 30,000 Russians lucky enough to be on vacation in Egypt are refusing to go home early. And in a Moscow winter, fatalism mixes with cynicism in a kind of toxic mental slush. Two days after the airport bombing, the newspaper Moskovsky Komsomolets polled readers about the authors of the bombing. The largest group, 41 percent, said they suspected it was organized by Russia’s security services. But foreigners here don’t share the same fatalism, or cynicism. They worry that they are now bulls’ eyes. Over the weekend, Russian authorities officially announced that foreigners were the targets of the January 24 airport bombing. The suspect, a 20-year-old man from Russia’s southern Caucasus, lingered in the area for 15 minutes, apparently waiting for a critical mass of foreign visitors before blowing himself up with the equivalent of three kilograms of TNT. By killing foreigners, Russia’s Islamic extremists hit a publicity home run. Last year, the number of terrorists attacks doubled in the Caucasus. Most merited a few lines at best in Moscow newspapers, and less in the world press. The Moscow metro bombings of April briefly flared up — and then flared down — in the world press. But by killing a Briton, a German, an Austrian, and a promising Ukrainian playwright in Moscow’s main, showcase international airport, the terrorists created a story with staying power. For the first time in memory, Russian terrorists are targeting foreigners. Now foreigners living here worry: will their gathering places be the next soft target for what seems like a war without end? The attacks cause similar worries for the Kremlin, which is trying to pull Russia out of its shell of isolation. The bombing came the day before Russian president Dmitry Medvedev was to travel to the World Economic Forum in Davos, Switzerland to woo foreign investors. One pet project was to lure $15 billion in foreign investment to build five ski areas in the Caucasus. The president went ahead with his visit and the investor pitch, but the timing could not have been worse. Looking ahead, Russia is to throw open its doors for a series of high profile, international sporting events – the Universiade, or world university games, in 2013; the Winter Olympic Games in 2014; and, in 13 Russian cities, the World Cup in 2018. 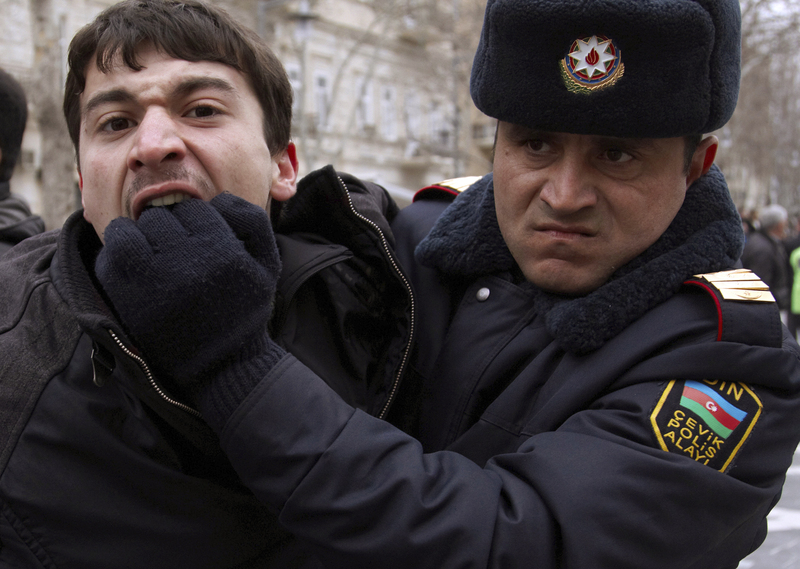 Violence has bubbled in the Caucasus for 20 years now. There is no reason to believe that peace will magically descend in time for these world gatherings on Russian soil. Two novelties for Russia — good detective work and Israeli-standard security measures — will be needed to get the country – and its foreign visitors through unscathed.